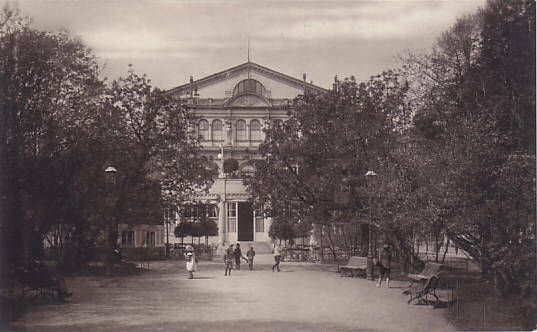 Built 1879 by Johan Jacob Ahrenberg as "Aleksanterin teatteri"/"Alexandersteatern". Used for performances in Russian. 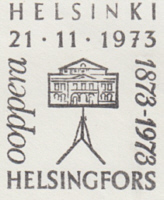 1917 renamed "Suomen kansallisooppera"/ "Finlands nationalopera". 1917-1993 home to the Finnish National Opera company. 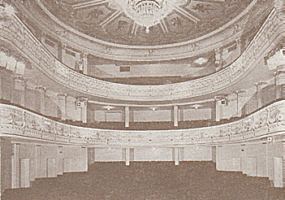 After a new opera house was completed in Helsinki in 1993, renamed "Aleksanterin teatteri"/"Alexandersteatern". Currently used for guest productions. 473 seats. 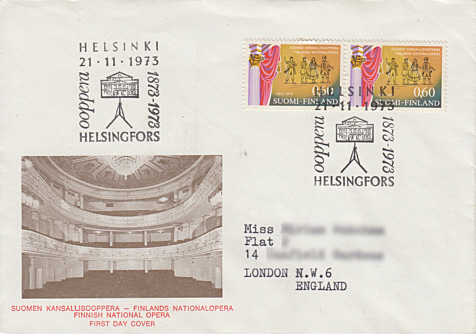 Front Text: "Suomen Kansallisooppera - Finlands Naitonalopera - Finnish National Opera - First Day Cover"
Postmark: "Helsinki 21 11 1973 ooppera 1873-1973 Helsingfors"